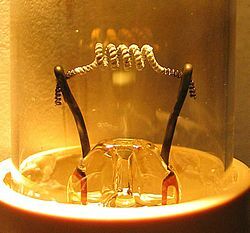 The Edison effect in a diode tube. A diode tube is connected in two configurations; one has a flow of electrons and the other does not. Note that the arrows represent electron current, not conventional current. Because the electron was not identified as a separate physical particle until the work of J. J. Thomson in 1897, the word "electron" was not used when discussing experiments that took place before this date. are the mass and charge of an electron, and h is Planck's constant.
. Experimental values for the "generalized" coefficient AG are generally of the order of magnitude of A0, but do differ significantly as between different emitting materials, and can differ as between different crystallographic faces of the same material. At least qualitatively, these experimental differences can be explained as due to differences in the value of λR. Thermionic emission can also be enhanced by interaction with other forms of excitation such as light. For example, excited Cs-vapours in thermionic converters form clusters of Cs-Rydberg matter which yield a decrease of collector emitting work function from 1.5 eV to 1.0–0.7 eV. Due to long-lived nature of Rydberg matter this low work function remains low which essentially increases the low-temperature converter's efficiency. ^ Paxton, William. "THERMIONIC ELECTRONEMISSION PROPERTIES OF NITROGEN-INCORPORATED POLYCRYSTALLINE DIAMOND FILMS" (PDF). Archived (PDF) from the original on 2016-11-23. Retrieved 2016-11-22. ^ "Thermionic power converter". Encyclopedia Britannica. Archived from the original on 2016-11-23. Retrieved 2016-11-22. Guthrie, Frederick (October 1873). "On a relation between heat and static electricity". The London, Edinburgh, and Dublin Philosophical Magazine and Journal of Science. 4th. 46 (306): 257–266. doi:10.1080/14786447308640935. Archived from the original on 2018-01-13. Guthrie, Frederick (February 13, 1873). "On a new relation between heat and electricity". Proceedings of the Royal Society of London. 21 (139–147): 168–169. doi:10.1098/rspl.1872.0037. Archived from the original on January 13, 2018. ^ Richardson, O. W. (2003). Thermionic Emission from Hot Bodies. Wexford College Press. p. 196. ISBN 978-1-929148-10-3. Archived from the original on 2013-12-31. Hittorf, W. (1869). "Ueber die Electricitätsleitung der Gase" [On electrical conduction of gases]. Annalen der Physik und Chemie. 2nd series (in German). 136 (1): 1–31. doi:10.1002/andp.18692120102. Hittorf, W. (1869). "Ueber die Electricitätsleitung der Gase" [On electrical conduction of gases]. Annalen der Physik und Chemie. 2nd series (in German). 136 (2): 197–234. doi:10.1002/andp.18692120203. Hittorf, W. (1879). "Ueber die Electricitätsleitung der Gase" [On electrical conduction of gases]. Annalen der Physik und Chemie. 3rd series (in German). 7 (8): 553–631. doi:10.1002/andp.18792430804. Hittorf, W. (1883). "Ueber die Electricitätsleitung der Gase" [On electrical conduction of gases]. Annalen der Physik und Chemie. 3rd series (in German). 20 (12): 705–755. doi:10.1002/andp.18832561214. Hittorf, W. (1884). "Ueber die Electricitätsleitung der Gase" [On electrical conduction of gases]. Annalen der Physik und Chemie. 3rd series (in German). 21: 90–139. doi:10.1002/andp.18842570105. ^ E. Goldstein (1885) "Ueber electrische Leitung in Vacuum" Archived 2018-01-13 at the Wayback Machine (On electric conduction in vacuum) Annalen der Physik und Chemie, 3rd series, 24 : 79-92. ^ Preece, William Henry (1885). "On a peculiar behaviour of glow lamps when raised to high incandescence". Proceedings of the Royal Society of London. 38 (235–238): 219–230. doi:10.1098/rspl.1884.0093. Archived from the original on 2014-06-26. Preece coins the term the "Edison effect" on page 229. ^ Josephson, M. (1959). 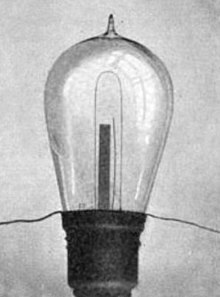 Edison. McGraw-Hill. ISBN 978-0-07-033046-7. ^ O. W. Richardson (1901) "On the negative radiation from hot platinum," Philosophical of the Cambridge Philosophical Society, 11 : 286-295. ^ a b Crowell, C. R. (1965). "The Richardson constant for thermionic emission in Schottky barrier diodes". Solid-State Electronics. 8 (4): 395–399. Bibcode:1965SSEle...8..395C. doi:10.1016/0038-1101(65)90116-4. ^ Kiziroglou, M. E.; Li, X.; Zhukov, A. A.; De Groot, P. A. J.; De Groot, C. H. (2008). "Thermionic field emission at electrodeposited Ni-Si Schottky barriers". Solid-State Electronics. 52 (7): 1032–1038. Bibcode:2008SSEle..52.1032K. doi:10.1016/j.sse.2008.03.002. ^ Orloff, J. (2008). "Schottky emission". Handbook of Charged Particle Optics (2nd ed.). CRC Press. pp. 5–6. ISBN 978-1-4200-4554-3. Archived from the original on 2017-01-17. ^ Murphy, E. L.; Good, G. H. (1956). "Thermionic Emission, Field Emission, and the Transition Region". Physical Review. 102 (6): 1464–1473. Bibcode:1956PhRv..102.1464M. doi:10.1103/PhysRev.102.1464. ^ Mal'Shukov, A. G.; Chao, K. A. (2001). "Opto-Thermionic Refrigeration in Semiconductor Heterostructures". Physical Review Letters. 86 (24): 5570–5573. Bibcode:2001PhRvL..86.5570M. doi:10.1103/PhysRevLett.86.5570. PMID 11415303. ^ Svensson, R.; Holmlid, L. (1992). "Very low work function surfaces from condensed excited states: Rydber matter of cesium". Surface Science. 269/270: 695–699. Bibcode:1992SurSc.269..695S. doi:10.1016/0039-6028(92)91335-9. ^ Bergeron, L. (2 August 2010). "New solar energy conversion process discovered by Stanford engineers could revamp solar power production". Stanford Report. Archived from the original on 11 April 2011. Retrieved 2010-08-04. ^ Schwede, J. W.; et al. (2010). "Photon-enhanced thermionic emission for solar concentrator systems". Nature Materials. 9 (9): 762–767. Bibcode:2010NatMa...9..762S. doi:10.1038/nmat2814. PMID 20676086. ^ Green, M. A.; Emery, K.; Hishikawa, Y.; Warta, W. (2011). "Solar cell efficiency tables (version 37)". Progress in Photovoltaics: Research and Applications. 19 (1): 84. doi:10.1002/pip.1088. ^ Ang, Yee Sin; Ang, L. K. (2016). "Current-Temperature Scaling for a Schottky Interface with Nonparabolic Energy Dispersion". Physical Review Applied. 6 (3): 034013. arXiv:1609.00460. Bibcode:2016PhRvP...6c4013A. doi:10.1103/PhysRevApplied.6.034013.